Banvel is firstly launched in early 1960s, now a famous herbicide for weed control in corn, cotton, sorghum, soybean, small grains, pasture, hay, rangeland, general farmstead, fallow, sugarcane, asparagus, turf and grass seed crops. This Auxin-type synthetic hormone herbicide interferes with Indolic Acetic Acid in growing plant parts inducing cell elongation. Subsequently the stem bends, the growing point swells and leaves curl causing death. Banvel controls tough broadleaved weeds, can be applied early, before weeds start to rob yield due to some residual activity, and still provides control until canopy closes. 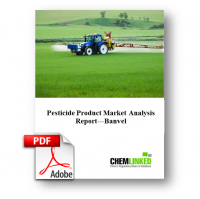 Application of Banvel in corn, soybean and grain has been increased by 5% annually in USA, Brazil, Argentina and EU countries. However, due to single does and slow promotion in China, Banvel’s development is at the beginning.